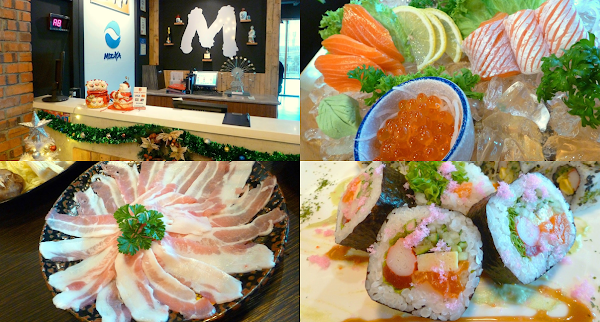 Mizuya Japanese Cuisine & Cafe (水屋) is located above a car showroom at Jalan Meru, Klang. The building is within a short drive from Klang Parade. The name "Mizuya" literally means "water shop", which in Japanese is an archaic term for "kitchen". Mizuya occupies Level 2 and 3 of the building. There is an elevator which carries customers to the main dining section on Level 2. With a wooden theme, the ambience appears upscale and relaxing. Two flights of stairs lead to Level 3 of the restaurant. Teppanyaki (鉄板焼き) is also served on the upper floor. Sake Sashimi Moriawase (鮭刺身盛合せ, RM33.00) is an assortment of raw seafood. The platter comes with 3 pieces of salmon (鮭) sashimi, 3 pieces of salmon belly (とろサーモン) sashimi, and a teacup of salmon roe (イクラ). Served over a bed of ice, the presentation of this sashimi platter is visually pleasing. Both the raw salmon and salmon belly are extremely fresh and succulent. The latter has more fat content, but the former is equally appeal. In either case, a pinch of wasabi (山葵) helps to enhance the enjoyment of these delicacies. Meanwhile, I also like how the salmon roe bursts in the mouth, releasing salty payload on my tongue. Australian Fresh Oyster (牡蠣, RM15.00 each) is an item from the Christmas special menu. The large, juicy oysters are satisfying to say the least. It's great that the oysters were sufficiently chilled to avoid any "raw seafood" smell. Odor is further suppressed by tangy yuzu (柚子) sauce. Also from the Christmas special menu is X'mas Maki (クリスマス巻き, RM30.00). There are two types of sushi in this order. The first type of sushi is prepared such that the sheet of seaweed faces out. Sushi fillings include tuna (マグロ), salmon roe, crab stick (カニカマ), omelette (玉子) and cucumber. The second type of sushi is called California roll, which is rolled such that vinegar-laced rice faces out. With similar fillings, but the rolls are also topped with mayonnaise egg salad, shrimp roe (えびこ), black sesame and chopped thyme. As expected, X'mas Maki is presented with a yuletide theme. Besides such modernist elements like mayonnaise, there is also a "snowman" made from sushi rice. Unfortunately, I feel that the X'mas Maki fails to impress my palate. If I were given another chance, I would have opted for a more conventional sushi instead. For something more filling, Buta Shabu Shabu (豚しゃぶしゃぶ, RM38.00) sounds like a sound choice. Pork broth is served in a stone pot, heated by a portable stove underneath. The broth is very rich in savory flavors, making it very gratifying to enjoy in small sips. Although the soup is considered "heaty", I think it is perfectly worthwhile. Shabu-shabu comes with ultrathin slices of chilled pork. I recommend that you blanch each slice very briefly so that the flesh remains pink and juicy. Each bite on the succulent pork is heavenly indeed. Other items included with shabu-shabu are shiitake mushrooms (椎茸), enoki mushrooms (榎茸), ramen (ラーメン), cabbage, carrots and scallion. Today's lunch concludes with a cup of Cafe Latte (RM8.00). Made from espresso and steamed milk, I find the latte to be reasonably enjoyable.